In Christmas: The Original Story, Margaret Barker explores the nature of the Christmas stories and the nature and use of Old Testament prophecy. Beginning with Johns account, it then goes on to include Luke and Matthew, the apocryphal gospels, and the traditions of the Coptic Church, to throw light upon the wise men and their gifts, the character of Herod, Matthews use of prophecy, the holy family in Egypt. 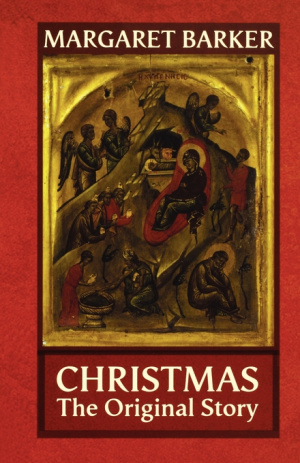 Christmas also discusses the stories we get from the Infancy Gospel of Jesus and the development of the Orthodox Christmas icon, as well as the Christmas story and the Mary material in the Koran. This is an accessible book based on scholarly work. Christmas by Margaret Barker was published by SPCK in October 2008 and is our 30376th best seller. The ISBN for Christmas is 9780281060504. Though written in an academic style I found this book fascinating. Margaret Barker uses her knowledge of temple tradition and Jewish culture in the time of Jesus, combined with research into ancient writings both Christian and secular, to explore the Christmas story. She sets the scene by writing of the temple, the stories and the politics of the time, and then introduces what she terms ‘other voices’, Adam, The Lady and The Hidden Descent. Having got us thoroughly intrigued she takes us through the Gospels of Luke, Matthew and The Infancy Gospel of James mentioning other writings on the way. Finally she explains the story as told in the Qur’an and finishes with extracts from a translation of the Qur’an. Very readable, I learnt a great deal that I didn’t know before. Got a question? No problem! Just click here to ask us about Christmas.